This tool shed is one of many out of the Treetops Traditional range. Many different sizes are on offer and this one offers a compact width with a slightly larger depth. It is incredibly secure and provides a safe and dry place to store all kinds of tools and equipment. 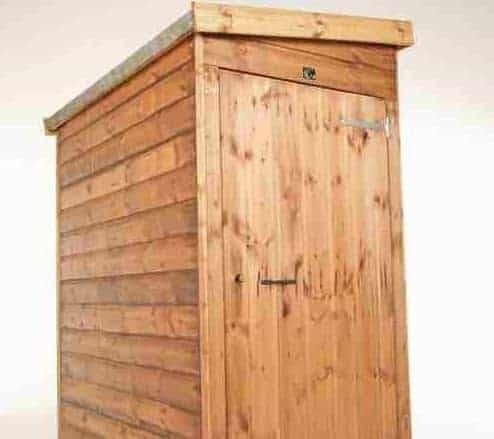 A signature feature of all Treetops Traditional sheds is that they come with customisable doors. A single door is supplied as standard and this can be moved to the opposite gable as the one shown on the picture. An alternative is to upgrade to double doors. As no windows are supplied, you can guarantee that all of your storage will be totally secure and away from prying eyes. It is also created with exceptional DEAL Redwood Shiplap tongue and groove cladding. This tongue and groove features heavily throughout the entire construction; even the roof and floor. As the manufacturer has dip treated the timber at the factory, it is also protected from damage during transit. A further treatment can then be delayed for up to 6 weeks after the shed has been erected. Annual treatments are required after that to keep it safe from anything the weather throws at it. 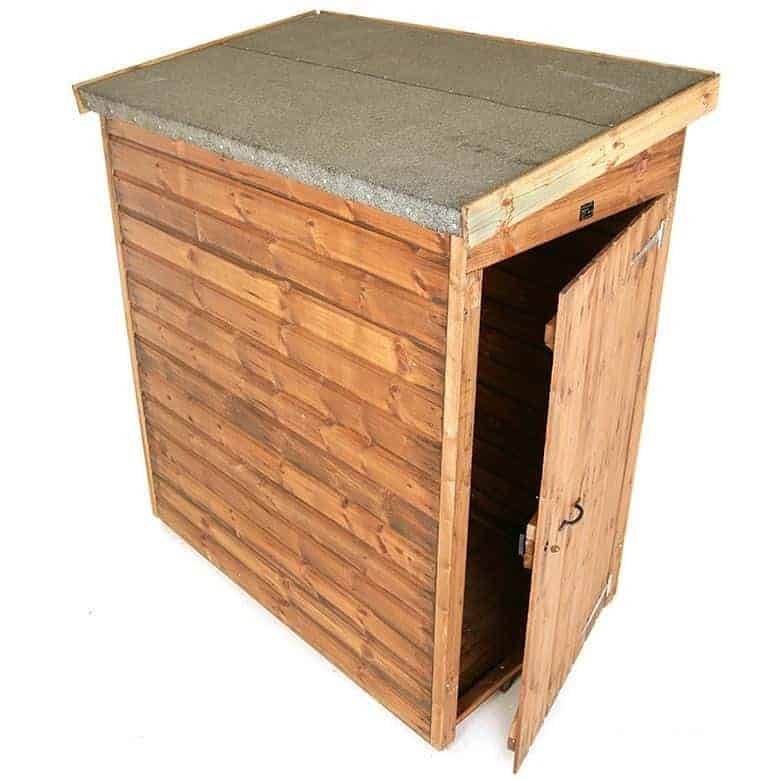 The only negative with this shed is that it comes with fairly poor quality roof felt. This won’t be expensive to change and we do recommend buying a fibreglass felt which won’t deteriorate over time. 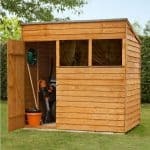 This pent shed is built to store expensive tools and equipment and is part of the very popular Treetops Traditional range. It is designed with security and longevity in mind and this particular size is large enough to accommodate most people’s storage needs. Whilst the shed isn’t designed as a walk-in building, if you’re shorter than 5’7”, you will be able to walk around comfortably. However, the height of the door means most people will need to duck to enter. One of the most beneficial measurements of this tool shed is the door width. It opens out to offer a great amount of access. The depth is also fairly large compared to the majority of sheds in this collection. Strong, rigid 12mm tongue and groove timber is used on the roof and the floor, giving it a very high quality finish. 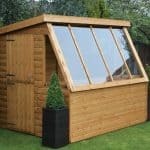 It also boosts the structural stability of the shed and enhances its longevity. A pent roof is used to allow assembly of the shed in front or to the side of other buildings. This roof style offers great protection against rainfall, whilst also acting as a space saving measure. A strong floor means you will never need to worry about the weight of the tools or equipment you are storing. 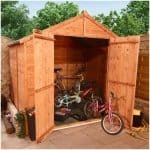 We love that no costs have been cut on the interior, unlike a lot of other sheds at the same price level. One of the stand out benefits of the Treetops Traditional sheds is that they use Redwood timber. This isn’t found on many other sheds and the Shiplap tongue and groove cladding ensures the building has a very strong, wind and rain proof design. With tongue and groove clad panels, they slot together snugly, whilst leaving behind a small expansion gap in case temperature and moisture changes cause the wood to warp. It is superior to overlap which means this shed is going to last a lot longer and provide much better protection against the elements. The frame is also superior to competitor models, measuring 44mm x 27mm. 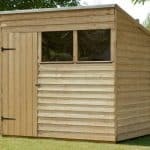 As with all the sheds in this range, the timber is dip treated for free by the manufacturer. Unfortunately this doesn’t mean you get away from the annual treatments, but it does mean you can delay initial treatment up to 6 weeks after installation. 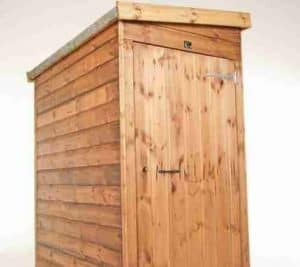 If you take a look at the Treetops Traditional pent tool store sheds, you will see they all allow you to customise the door. In the description for this shed you’ll see it states you can upgrade to double doors. However, under the extras on the site, this option isn’t presented to you. This is likely because of the specific size of the shed. So if the double doors are something you are interested in, you will need to contact the manufacturer to see if this model applies for the double upgrade. The single door that is supplied is designed to the highest of standards. Strongly braced there isn’t much chance of it sagging and it is also well-secured via a built in lock. There are no windows with this design and you do not have the option to add them. This is to ensure all of your expensive equipment is properly secure. You will not find a more secure tool shed than this one. No windows mean thieves cannot see what you are storing and a key operated lock makes it very difficult for them to break into the shed. Absolutely no upgrades are necessary to improve the buildings privacy and security. The customisation options are where this shed really comes into its own. Not many tool sheds give you the chance to customise the door. 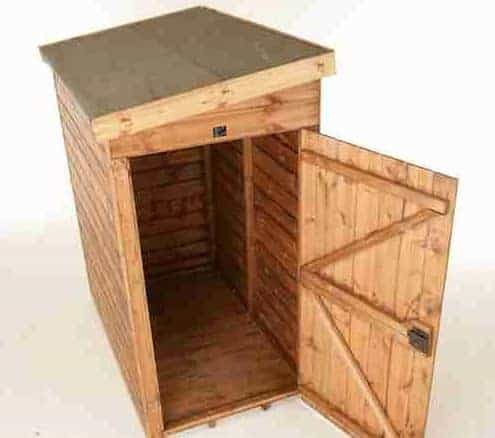 Shed Store give you two options with this model. A single door is provided and your two options relate to where you want this door to be placed. It can be added as shown in the picture, or it can be switched to the opposite gable. 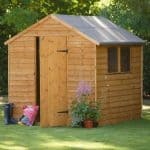 Now in the description of this shed, it does state you can also add double doors instead. With this model however you are not given this option on the site and you will need to contact the manufacturer to see whether it is available. There are also a couple of extras you can opt for if you have the money. The first are floor bearers. These will lift the floor of the shed off the ground, helping to keep it ventilated and away from the damp. They are really affordable and we highly recommend you buy them if you want to further protect this high quality building from rot. The second extra is a garden building installation service. 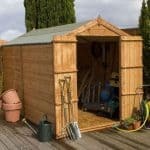 We advise against this as whilst it will save some time and effort, the shed is really simple to self-assemble. Not many sheds receive our 10/10 quality rating but the Treetops Traditional range is one of the highest quality builds we have come across. We’re pleased to see that the interior matches the quality of the exterior and we also love the small high quality details that have gone into the design. This is a structurally sound shed that is built to last for many years. However, you do need to apply annual treatments and we would advise changing the roofing felt that is supplied with the shed for a better quality covering. There is a good deal of depth available, but the width is very small. So this will make a difference to the type of tools and equipment you can store. 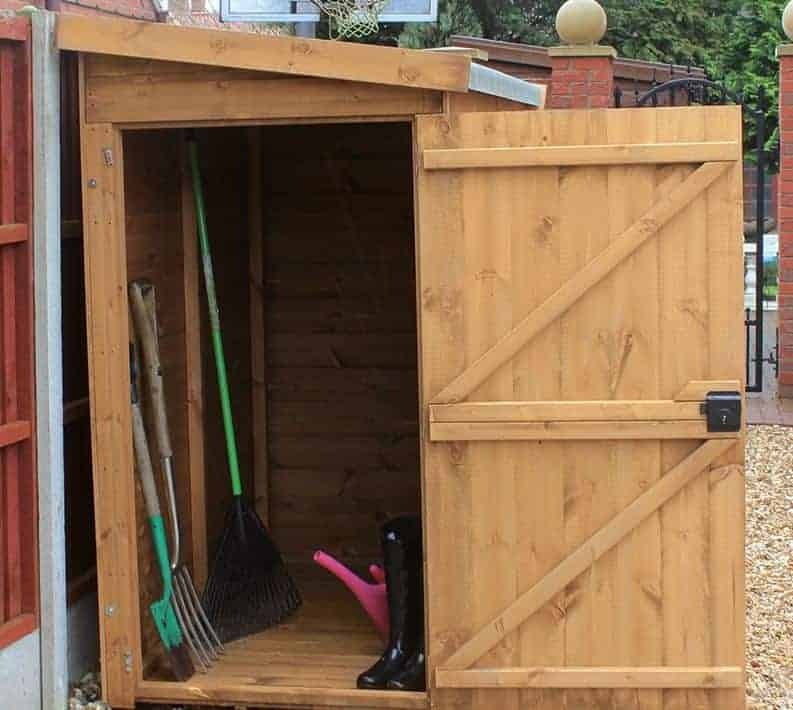 There are no complicated steps to worry about in the installation of this shed. All instructions are provided, though some customers have reported they aren’t very helpful. However, you should find you don’t really need them as it is a very simplistic process. The quality and durability of this shed is amazing. The price you pay is nothing compared to the huge benefits you receive. Final Thoughts: It’s hard to find anything to dislike about the Treetops Traditional pent tool store shed. An extraordinary amount of detail has gone into its entire construction. From the secure key operated lock to the 12mm thick Redwood tongue and groove Shiplap cladding; this is one of the best quality models out there. Dip treated prior to delivery, the shed is already fully weather resistant, though annual treatments will be required. Being able to customise the door is an excellent advantage and its windowless design also adds to its secure and solid construction. There are many sizes in the collection and this is one of the deeper variations on offer.